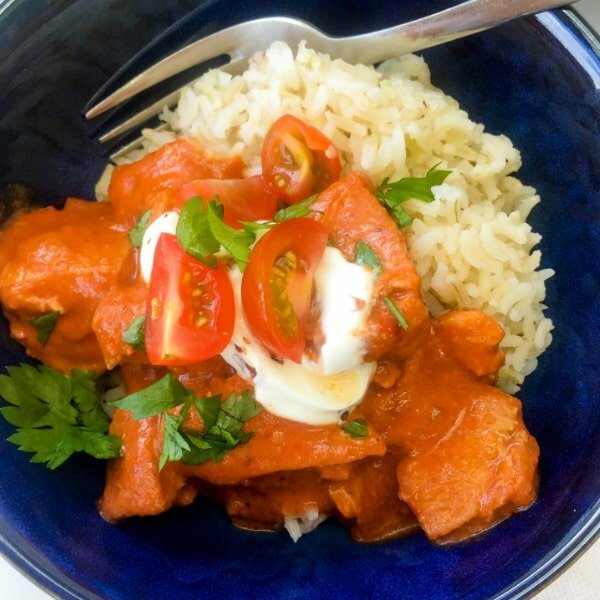 You’ll be thinking about this Clean Eating Chicken Tikka Masala for days after it’s gone. Tender chunks of chicken smothered in an unbelievable mild curry sauce. This is an easy, kid friendly mild Indian curry that takes 10 minutes active prep work, and then you can simply turn on the slow cooker (or pop it in the oven) and return a few hours later to a hearty, rich and mighty delicious family dinner. For someone who obsesses about food, I spend a surprising amount of time stuck deciding on what to make for dinner – especially during school holidays. I’m generally on top of my ‘what’s for dinner’ game during the school term, but as soon as school holidays arrive, I break. Like right now. It’s 5.38pm. Dinner is at 6. I’m pretty sure at least two kiddies are going to come walking up the hallway soon to ask ‘what’s for dinner, Mom’. The Stuck for Dinner Issue. I’m starting to think that the school holidays are longer now that I’m a parent. It doesn’t help that my meal planning mojo goes out the window as the kids erratically graze their way through every ingredient in the house. I’m not even half joking about this. This week (it’s only Tuesday), I found one with the tub of peanut butter and a spoon, and another with what appeared to be an entire loaf of bread on his (giving the culprit away here) plate. Teenagers, man. It’s times like these that I remember why I wrote this cheat sheet of 12 fast and easy weeknight meals (you can get it here). So, now I’m thinking dinner will be leftover chicken tikka masala quesadillas. ** UPDATE: These were good – easy to make too using wholewheat tortillas and leftovers!!! I got a little sneaky with the leftovers last night and froze them. That way I can guarantee they will still be there. If I had left it in the fridge, it would have vanished by breakfast. I was hoping to save the leftovers for next week, but it’s too tempting. This is one of the easiest Indian Curries to make at home. Especially if you are looking for a way to jazz up a regular chicken breast. You may already have most of the ingredients in your pantry too, so it’s a fantastic recipe to keep up your sleeve when you find the fridge a little bare. 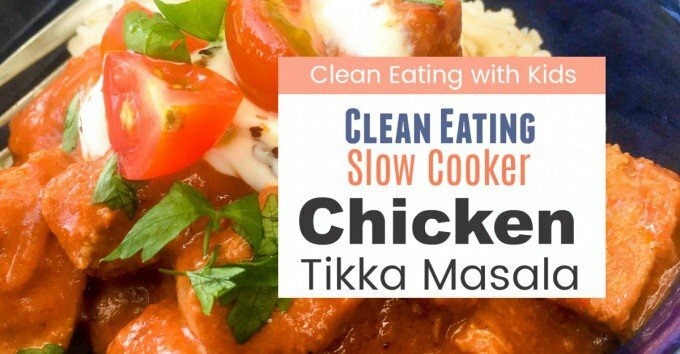 Chicken tikka masala is a relatively clean kind a meal no matter how you make it. It’s a basic combination of chicken, onion, ginger, garlic and spices combined in a tomato and cream sauce. Slow Cooker, Oven or Skillet? This is up to you. The only thing that can’t be avoided is the searing of your chicken pieces before adding your sauce. I know there are some recipes that say you can skip this step, don’t fall for this. I know that if you’re slow cooking this means two dishes to wash, but it’s worth it! Traditionally this dish is made by char-grilling the chicken pieces in a wood fired tandoor (clay oven). But since I don’t have one of these, I need to rely on my trusty oven top to do the job. Turn your skillet or fry pan on high and cook your chicken pieces in batches, searing all round each piece. If you put all the chicken in the pan at once, you will get too much moisture in the pan so take a few minutes to work your way through the chicken, char-grilling in 2 – 3 batches. You don’t have to cook the chicken through, just fry your chicken enough for it to seal the outside and turn the outsides a little golden. Check your pantry for these spices. 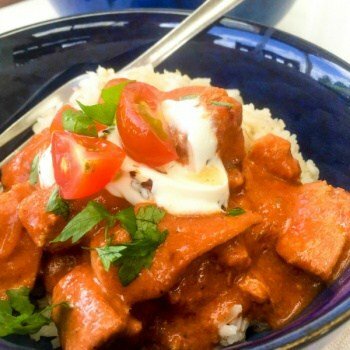 Traditionally tikka masala is made using bite sized chunks of chicken breasts as they keep their shape well and cook a little more quickly (great for a weeknight meal), but you can use thighs too if that’s what you have on hand. If you are making this meal for the family, then start off on the mild side. Kids can be chili averse when they are young. For this weeknight version I made here, I skipped the Cayenne Pepper totally, and simply added some diced chilies to my husband and my plates at the end. 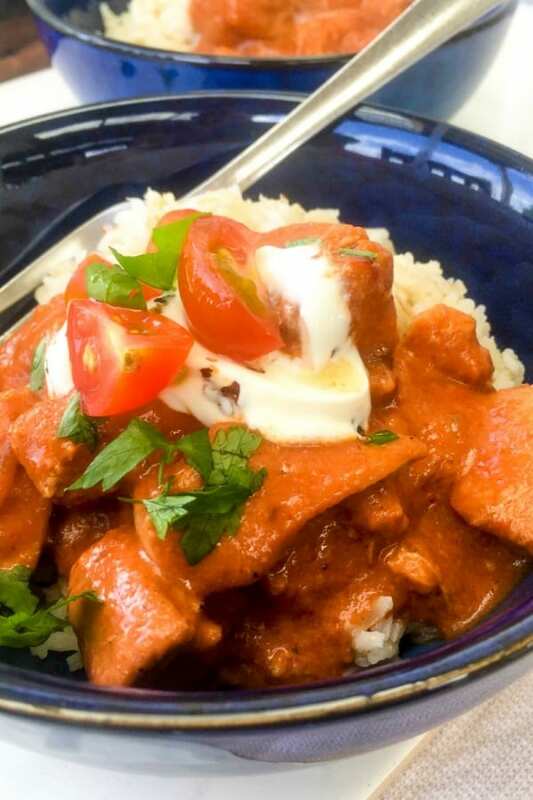 To add some heat to your tikka masala sauce, add a 1/2 – 1 teaspoon Cayenne Pepper at the prep stage. Taste the sauce before adding more. I know that weeknight meals are often planned last minute so marinating your chicken overnight might not be an option if you want to make this recipe tonight. I tested the recipe with varied marinating times, and to be brutally honest (I’m sorry to all you die hard cooks out there), I didn’t find too much of a difference to the taste. So, feel free to marinade for 10 minutes or overnight. Whatever works for you. The longer you marinade the more tender the chicken, but since we’re dealing with chicken breast here, it’s not a big deal. I really like the flavor that the coconut adds to the rich tomato sauce. My daughter has lactose issues, so I try to limit dairy as much as possible. It’s a lighter option of you are trying to cut calories or lose weight. This is a fantastic recipe to divide up into containers ready for the weeks meal prep. My advice is freeze a batch otherwise the family will devour it the next day. Get more on Meal Planning Tips here. 1 large onion, finely sliced or diced. Marinade your chicken pieces by combining: 1/4 cup plain yogurt, 2 teaspoons lemon juice, 1 teaspoon of each of these -crushed ginger, crushed garlic, garam masala, ground coriander. Cover and leave to marinade for at least 10 minutes. Heat up a skillet on the stove, add a little ghee or coconut oil. Cook your chicken pieces in 2 – 3 batches for a couple minutes to sear / brown the edges. Don’t worry if the chicken isn’t cooked through. It will finish cooking in the slow cooker. Pop the chicken in the slow cooker and add your sliced onions, a little ghee or coconut oil to your hot pan. Fry for a couple minutes until soft. Add the remaining garlic, ginger and spices to the pan and fry for 1 – 2 minutes, stirring to stop any sticking to the bottom of the pan. (See Note 1). You will start to smell the flavors developing. Add the onion and spice mix to your chicken in the slow cooker. Stir in the tomato puree and coconut milk. Cover the Slow Cooker and cook for 2 – 3 hours on high. Serve with cooked brown rice. (See Note 2) and top with a dollop of plain yogurt (optional) and fresh coriander. For a hotter curry, add 1/4 to 1 teaspoon of freshly sliced Chili or Cayenne Pepper at this stage. Start with less, taste before adding more. I like to make a quick salad with sliced red onions, baby tomatoes, cucumbers and coriander to serve on top of my curry. If you want a little more heat, you can include some chopped fresh chilies too. Olive oil has a lower smoke point than ghee or coconut oil, so I don’t use it for high temperature cooking. Stove top Cooking – cook with lid on for 25 – 30 minutes on medium heat. Oven Cooking – transfer to oven proof dish and cook uncovered at 350F / 180’C for 40 minutes.